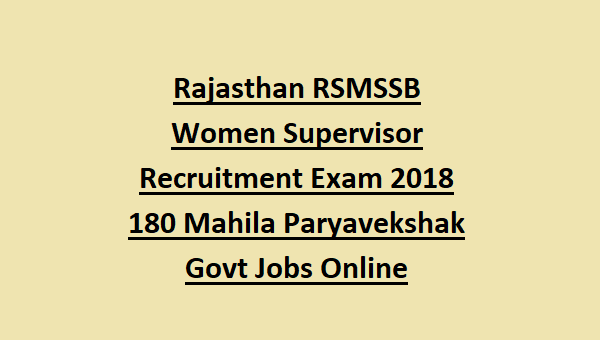 Rajasthan RSMSSB Women Supervisor Jobs Recruitment Exam 2018: Rajasthan Subordinate and Ministerial Services Selection Commission RSMSSB invites applications from the female candidates for the recruitment of available Women Supervisor jobs in Women Empowerment Department. Candidates who are qualified Degree and knowledge in Hindi Devanagari lipi or Sanskrit they can apply online or this RSMSSB Women Supervisor jobs. Last date for online form submission is 03-11-2018. Online form will be accepted through official website of www.rsmssb.rajasthan.gov.in website only. Candidates selection for this RSMSSB vacancies will be held through merit in Written Exam only. Written exam will be conducted in the month of January 2019 for this RSMSSB Women Supervisor jobs recruitment 2018 notification. There are total 309 Women Supervisor vacancies available in this RSMSSB Mahila Paryavekshak Adhikari recruitment exam 2018 notification. Available vacancies category wise, qualifications, age criteria, how to apply online, salary, exam pattern and syllabus and other details of RSMSSB Women Supervisor (Mahila Paryavekshak) recruitment exam 2018 notification are given below. Notification of RSMSSB Women Supervisor (Mahila Paryavekshak) Recruitment Exam 2018. Vacancies available in Rajasthan Women Empower department is 309. The candidates must have qualified Degree from any recognized university. Knowledge of Hindi in Devnagari Script or Sanskrit and knowledge of Rajasthan Culture is also mandatory to applying this Supervisor Mahila adhikari jobs. The candidate's age limits as on 01-01-2019 is 18-40 Years. 5 years of upper age limit relaxation will be given for reserved candidates. For this Women Supervisor posts of RSMSSB a written test will be conducted. Written exam will be held for 300 marks. Exam duration is 3 hours. Detailed exam pattern and syllabus will be updated later. Exam syllabus will be Degree level only for this RSMSSB Jobs. Exam syllabus in pdf format for RSMSSB Women Supervisor Jobs 2018. Candidates can pay the fee payment through online or via Kiosk centers. Candidates who are interested in this RSMSSB jobs they can apply online through rsmssb.rajasthan.gov.in. Last date for online application for this RSMSSB vacancies is 03-11-2018. Only online applications are accepted for this Women Empower Department Female Supervisor adhikari jobs. Click here to apply online for the RSMSSB Women Supervisor Jobs Recruitment 2018. 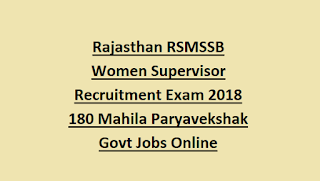 Please share this RSMSSB Women Supervisor (Mahila Paryavekshak) Recruitment Examination 2018 article to your friends via social pub sites such as Facebook, Google Plus and Twitter.